No doubt it was the highlight of our vacation in Bohol. Last December 30, we trooped from the mountains of Sudlon, Alicia, Bohol, where my wife hails, to the enchanting white sands of Candabong, Anda, a nearby town, for a cool Rizal Day splash. The beach was public. We paid absolutely nothing to get in. The sand was creamy white and not artificial, unlike those in other private resorts in the province. At the farthest end of the semi-oval stretch of white sand is a small rock/island shaped like a soldier's helmet. Along the shore were lines of boats and huts lying idly, as if time has stopped in that corner of the world. When we arrived (at around 9am) there was nobody there. We had the whole place to ourselves. When my 5-year old son saw the place, he smiled all the way up to his ears. Then he plunged and spent the whole day on the water. A few other groups arrived later, but there was still plenty of space run around. In fact, there was plenty of space to do our barbecue and some cooking. Our biggest expense that day was the transportation going there. All other expenses were minimal. The rent for the hut was only P150. The rent for the floats (inflated tire interiors) ranged only from P20 to P50 for unlimited use. Incidentally, we were told that you can take a pump boat ride, from one point to another, for only P150. I was totally enchanted by the place. 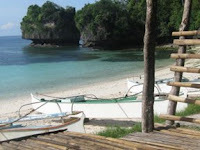 I didn't know that there was any other place in Bohol with beaches that can rival those in Dauis and Panglao. There is. Anda, a fifth class municipality located 100km from Tagbilaran, is home to a lot of white-sand beaches which have been described as "better than...". In fact, aside from the beaches, I learned that the town also has a waterfalls (Anda Falls at Barangay Casica) and a "mountain paradise" at Barangay Tanod and Linawan. And not only that. I also learned that Anda has a rich history as shown by primitive burial caves (Candabong, Bacong, Virgen, Casica and Talisay) and rock paintings (Lamanok Point, Barangay Badiang) located on cliffs beside the sea. Its rich history flourished through the years. The town was officially created during the Spanish era and named after Governor General Simon de Anda y Salazar. Its church had Spanish priests up to as late as 1937, the last one being Fr. Luis Llorente, who left long after Spain ceded the Philippines to the United States. As if these were not enough trivia, Anda is home to the mysterious (some say miraculous) remains/tomb of Potenciana Saranza (Inday Pontenciana), a teacher from Gingoog City, who after her death in 1953, had allegedly performed miracles by healing the sick. A lot of people now go to her shrine and consider her a "saint". With all these, wouldn't you want to visit Anda? This would be a welcomed off-the-beaten-path destination for a vacation. Away from the more popular resorts in Panglao and environs. And good of hear of the former resident of Gingoog City who is buried there. Sister city to Cagayan de Oro from the old home province of Mis. Or. i was told of the beauty that anda holds a couple of times before. after reading this, will definitely have to find a way to see it. Sano, I think I have been there recently. We went home May 2007. My wife is also from Alicia (La Hacienda). I do not mean to be negative but we did not like our experience. It was lunchtime and the place was packed full of people. Some of them came from Pilar who celebrated their winning a basketball tournament. In short, these youths got drunk and started fighting and showing their small fan knives. My wife was distressed and very worried because of our young sons. I guess we're not used to the situation anymore. I loved the beach because it was small and concave shaped. I was fantasizing that I own it. However, it was cantilado and the current was quite strong (high tide that time we went) and again I was worried for my sons. The joys of being a parent, huh? Can I invite to my Blogger blog Bohol On My Mind? I just started it and I would appreciate your comments on it. More power! I wish I have your positiveness but I like to tell as it is. sano, am sorry your experience there was not so good. i guess the place is not always as "deserted" as when we were there. we did not notice that it was "kantilado". i practically just allowed my 5 year old son walk/swim around. still, the place is managed well (i presume by the lgu), i think there is great potential. for example, why can't it be developed into something as great as the river cruise in bohol. It must have been a different beach we went to. Yes, there should be a need to expand tourism opportunities in our province. Bohol has so much to offer not just the usual attractions. I guess it will take sometime to do that. while much could be written about the sights and natural wonders of Bohol, as a non-resident (more familiar with Cebu and Northern Mindanao) I could also suggest that a lot could also be written about the Bol-anons in the island. Noticed in my last visit that the cities there are not as unregulated and affected as the other cities thereabouts. People still have that small hometown feel and attitude, which is good. hi amadeo. yes, i agree with you. in addition to the beauty of place, there is the "beauty" of our people. they too are worth writing about. hi gibo, any pictures of the place? the way you described it, I'm already interested. I am a Baclayanon but very glad to promote any town of my beloved Bohol. Cheers. hi fence. checkout my multiply account at http://www.gibo37.multiply.com . i have more pictures there of the beach. for more info, checkout also the links on the sidebar (blogs and resorts/hotels). there are some of them that are in anda, bohol. hey!kumusta na!i have actually been to dapdap, another beach resort in anda a few yrs ago.very beautiful!i will be going home in feb with my husband and 2 yr old.will make it a point to stop by anda. I'm from Bohol (where my parents hail from) but I grew up in Del Monte, Bukidnon and am now based in Manila. So it's nice to know that Bohol has a lot more charms tucked somewhere in the not-so-well-known areas. I'll definitely visit your recommended off-the-usual-tourist-track spots. hi, can i ask something? the hut that you stayed in P150/day.. can i have more information about it? because me and my friends will be having a short trip to bohol in may.. and we are looking for minimal accomodation for 2 nights in bohol.. can contact me pls? Sano taga asa man ka? taga Mabini ko sano. 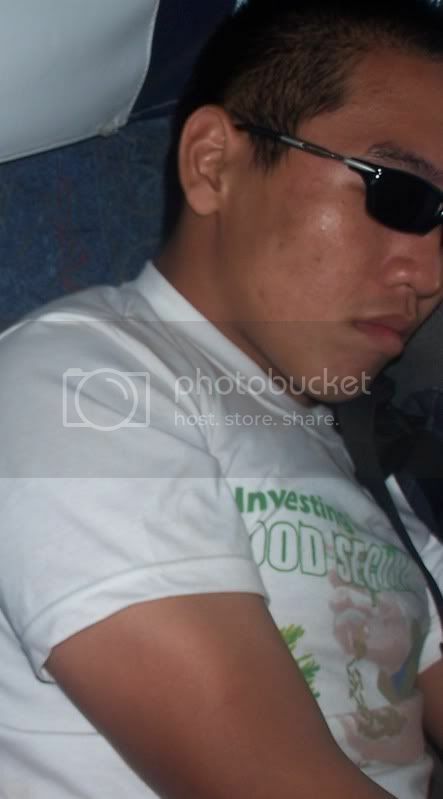 your blog about bohol is very nice. taga san isidro, tagbilaran mi bay. thanks for the compliment. you have a nice blog too. area is "ADJUDGED AS THE PARADISE OF THE EAST OF BOHOL"
Bro, thanks for posting Anda Beaches here. I am also from Anda and I can say its natural there and unspoiled beach to enjoy. even in the Poblacion (towncenter), the sand is superb. I will invite you all, if you dont mind, to register and join www.boholanoworldwide.ning.com This site is for all Boholanos wherever they are in the world. See you there..God bless. Sweet web site, I hadn't come across bol-anon.blogspot.com earlier in my searches! Not just the beaches are untouched. Ang mga walay grado sa Anda daghan kaayo, untouched pod ila utok. They should be educated on how to treat foreigners with respect, how to take care of the rich natural resources - meaning not to do illegal activities in the seas, cut so many trees, destroy the rocky hills to sell boulders and small stones. Kani mga wala katungtong ug eskwelahan sa Anda maka-realize unto nga kanang kwarta ni Amper kung election, dili makapa-improve sa ila lives! Ang mga educated people sa Anda nang-langyaw na lang kay ga-hawod2x man ang mga walay UTOK nga corrupt diha!